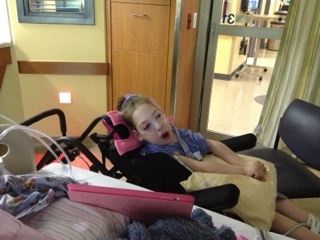 Casey has been on a pretty intense respiratory treatment schedule over the past few days. She is doing 3 hours on bipap, then a round of 3-5 different breathing treatments (nebs) and IPV (with lots of suctioning as we go). The nebs and IPV run for 30-45 minutes. When she finishes these we flip her over, clear everything out as best as we can, change her diaper and clean up her surgery wounds and try to give her a little break. She has 3 hours from the time bipap stops until we have to get her back on. The morning break includes a round of xrays that are always hard on Casey. During the 2-2.5 hour break she tries to rest as much as she can. Today during her afternoon break some friends of hers came by and we were able to get her to sit up in her chair for about an hour. She can sometimes get really freaked out when she is on bipap and trying to escape. Since it’s subtle and unless you are right next to her you would not know, this means Tim or I have to be awake and just watch her during each session. I am so glad that he was able to take medical leave and be here with me. I can not imagine doing this with him still working during the day. Each morning when the doctors come in to round we are hearing pretty much the same old story over and over again. The xray looks a little better, not much, but a little. As long as we are moving in the right direction we are happy. It just breaks our hearts to watch her work so hard all day/night and not get the results she deserves. Hopefully soon. The other day (after losing her 4th IV) the doctor placed a fem line. We thought/hoped that would be the last IV for this stay. The fem line has officially failed and got pulled today. They placed a new fem line in her other leg this morning. We are at 20cc/hr on her feeds and advancing VERY slowly to help reduce pain issues. Until we are tolerating full feeds (30-40cc/hr) for more than 24 hours we will keep the fem line (or some line) in place for feeding her through the IV. Casey is revving up for another night of hard work. They may try a different type of machine tomorrow (maybe) that will push the air into her lungs a little different. They are not sure if she will tolerate it though, so we will see how things go. We had hoped that we would see Casey’s PT today, and the hospital music therapy. Neither came by, so hopefully we will see them tomorrow. Casey still doesn’t have her voice back, but I am sure she would love to listen and do what she can. We just got some good news. Casey’s friend, Guiliana, that was admitted on the dame day as Casey was able to go home today. I am sure they are all going to be VERY excited to be back home. That’s about it for today. Thank you again for the continued thoughts and prayers. ← What is Cerebral Palsy (CP)?